As I pen these lines on July 20, news of demonstrations for Palestine solidarity is pouring in from across the world. As has been the case for several years, the largest mobilizations have not been reported from either the idiomatic Muslim World or the Arab world. Expectedly, the largest rally was in the ‘infidel’ city of London. Roughly a hundred thousand marched yesterday (July 19) to protest the latest Israeli invasion of Gaza. Again, it is hardly surprising that Muslim residents of London were largely absent. Hopefully you will remember that the largest anti-war demo was also held in London in February 2003, ahead of the catastrophic US misadventure in Iraq. Literally, every corner of European civil society has protested against Israeli brutality. Even inside Israel, there have been small protests held by radical Israelis. From ‘Hindu’ India to ‘Jewish’ Israel itself, people have staged manifestations to express solidarity with Gaza. A while ago, I visited Daily Jasarat’s website (July 20 online edition). On the front page, I found three items of Gaza-related news but not a word about the huge demonstration in London. In the last few days, your propaganda machine has been busy portraying the invasion of Gaza by Israel as a clash of civilizations. There is no mention of these manifestations on your Facebook page either (By the way, don’t you think Facebook is a ‘Jewish-run’ outlet?). On the contrary, your spokespersons and propaganda organs mourn American and European double standards rather than lament ‘Alm-e-Islam ki khamoshi’ (Silence of the Islamic world). I do not disagree on your viewpoint regarding Western double standards. However, I do not view the West as the monolithic “infidel’ as do you. In your attempts to essentialize the West you ignore the fact that there is the Western ruling class, a minority, and there is the working class, a majority. Over and over again, in the last 15 years alone, the working class majority in the West has expressed its solidarity with their counterparts in the Muslim world. By the way, did you hear anything in recent days from Saudi Arabia regarding Gaza? Any condemnation? Any reports of manifestations? I do not follow Saudi media. Let me know if you come across any such news. Incidentally, I am writing you from Sweden. A sizeable majority of Swedes are atheist. This is the most ‘infidel’ country one can imagine. The Palestine solidarity I have witnessed in Sweden, I see not a fraction of in Pakistan. When Olof Palme, Sweden’s charismatic social democratic prime minister, was assassinated, fingers were pointed at Israel as well as the CIA and South Africa. Do you know why? He was a vocal PLO supporter. In 2009, a Davis Cup tennis match between Israel and Sweden was played in Malmo. Because of the fear of anti-Israel demonstration and potential for dangerous consequences spectators were banned from the arena. The match was played without spectators (to read more on this click here). In 2010, when an aid flotilla to Gaza was attacked, Swedish dockworkers boycotted Israeli ships for a week. Have you ever heard of Rachel Corrie? She was only 22 when she was over run by an Israeli tank. This American citizen/activist was killed when she stood along with fellow activists in front of Israeli tanks dispatched to demolish Palestinian homes. What about the Boycott Divestment and Sanctions (BDS) campaign? While fake Pakistani Sufis secretly visited Israel, the disabled atheist Stephen Hawking refuses to visit Israel as part of a growing academic boycott campaign. Only this morning, I read about South African activists removing Israeli products from the shelves in superstores. I could continue for a long time but I will stop here because my purpose is not to establish the non-religious character of the Palestine question. Were it merely a question of religion Edward Said and Leila Khalid would not be symbols of the struggle for the Liberation of Palestine. My aim is to point out a few anomalies in your current Palestine discourse. In the first place, I find it contradictory that you are highly agitated at the bloodshed in Gaza and condemn Israel bitterly. However, you had no qualms in playing on General Zia-ul-Haq’s B-team. I am not certain if the IDF has killed as many Palestinians in Gaza as Brigadier Zia-ul-Haq massacred in Jordan during the Black September. Should you not condemn every butcher who slaughters Palestinians? Likewise, I cannot help but notice your silence over ISIS brutalities. Your Arab cousins have not merely destroyed the future of Iraq and Syria they are determined to devastate the glorious past of these unfortunate countries as well. As I mentioned I am writing you from Sweden. Yesterday, Swedish TV (SvT) reported that Mosul has been emptied of Christians. ISIS presented three infamous options to poor Christians: Islam, Jazya or death. The Mosul Christians opted for the fourth: exile. Ironically, as fellow Arab countries are busy fueling sectarian strife in Syria and Iraq, ‘infidel’ Sweden has embraced 100,000 Iraq exiles since 2003 and any Syrian landing in Sweden is granted permanent residence from day one. Constituting the biggest non-Swedish community, Iraqis are likely to be overtaken by Syrians. Have you ever heard of citizenship and equal rights for Palestinians, (let alone slave-like South Asian guest labourers) in Saudi Arabia or its neighbouring sheikhdoms? You have good relations with the Saudi dynasty. Have you ever raised the demand for Saudi citizenship for Palestinians (let alone guest labourers from Pakistan and Bangladesh)? Perhaps, we should leave respect for human rights to ‘infidel’ Sweden. Honestly, you give a bad name even to hypocrisy when you invoke human rights. Your role in former East Pakistan and silence over Taliban atrocities is too grim to grant you the moral high ground for invoking human rights. 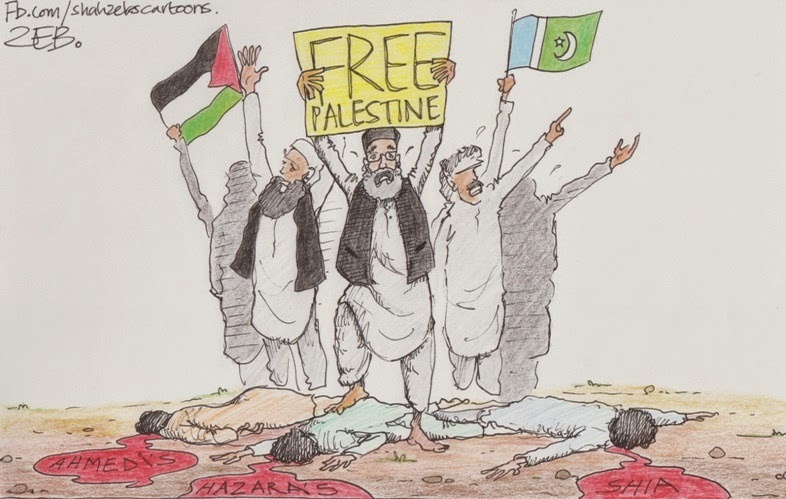 Before demanding human rights for Palestinians, better start respecting them in Pakistan. The University of Punjab will be a good starting point.